10 things you might not know about CAPTAIN AMERICA: THE FIRST AVENGER | Warped Factor - Words in the Key of Geek. 1. Marvel first began planning a Captain America movie in 1997. Mark Gordon and Gary Levinsohn were attached to produce the film, with Larry Wilson and Leslie Bohem announced as script writers. Come May 2000, Marvel teamed up with Artisan Entertainment to help finance the picture, however a lawsuit arose between Marvel Comics and Joe Simon over the ownership of Captain America copyrights, and the development of the movie was put on hold. The lawsuit wasn't settled until September 2003, but it would be another two years until Marvel would return to the idea of a Captain America movie. 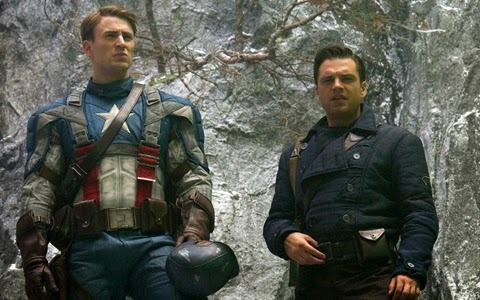 Originally the film was intended to be a stand alone tale, with producer Kevin Feige stating "about half" of the movie would be set during World War II before moving into the modern day. This was before the concept of the Marvel Cinematic Universe was decided upon. In February 2006 producer Avi Arad said that Marvel hoped to have Captain America ready for a summer 2008 release date. At this point in time Jon Favreau was in discussion to direct, his idea was for it to be a comedy, Marvel had other plans and Favreau turned his attention to Iron Man. It wasn't long after when Joe Johnston entered negotiations to direct, but again the movie was put on hold thanks to the 2007–2008 Writers Guild of America strike. It would be November 2008 when Johnston finally signed on the dotted line, and pre-production fully began. 2. Amongst the actors who auditioned for the role of Captain America were Garrett Hedlund, Channing Tatum, Scott Porter, Mike Vogel, Wilson Bethel, Michael Cassidy, Chace Crawford and Jensen Ackles. But one of the early favourites amongst the producers was Sebastian Stan, who ended up being offered the role of Bucky Barnes instead. 3. Three actors made the final short list for the title role, Ryan Phillippe, Chris Evans and John Krasinski (Jim from the US version of The Office). Before it was announced the Chris Evans would be playing Captain America multiple news sources were reporting that John Krasinski had it in the bag and it was basically his to lose. Clearly, lose it he did! John Krasinski as Captain America??? Find out all the actors who could've been the Avengers here. 4. It seems that Chris Evans took some persuading to play the part. After feeling burnt (pun intended) from playing Johnny Storm in the Fantastic Four films he was not interested in another Marvel comic book franchise. He said he wasn't initially keen to once again embrace the extra attention which comes with such a high profile role like a comic book superhero, and so Evans declined the part of Cap 3 times. It took the personal approaches from Joe Johnston and the producers to finally convince him to take the part. 5. It may surprise you to know that Chris Evans was paid just $300,000 for his starring role in Captain America: The First Avenger! Obviously it's nothing to be sniffed at, but compared to most Hollywood salaries it was on the small side. The contract did however come with a condition that he would earn $2million to appear in The Avengers. 6. Recently Marvel have finally negotiated the rights to include Spider-man in their Cinematic Universe, this had been a long ongoing process which never really looked like happening until the last minute. As Marvel do not hold the screen rights to all their characters this wasn't the first time (and likely won't be the last) that they have attempted to 'bring one of their own back'. 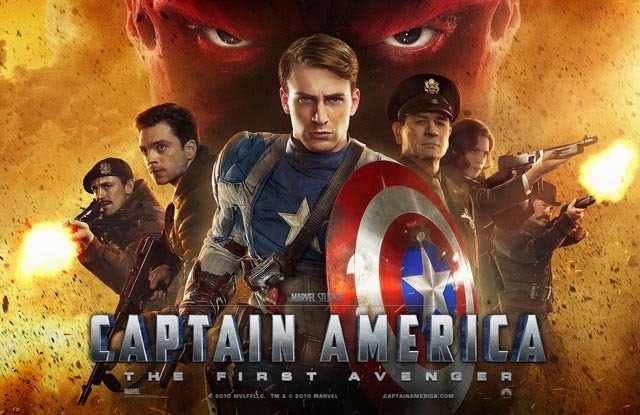 In 2008 the early script for Captain America: The First Avenger included cameos for James Logan Howlett (Wolverine) and Erik Lensherr (Magneto). The big screen rights to The X-Men characters remain with Fox, but due to their existence during World War II (Logan would've been featured as a solider and Erik as prisoner) Marvel hoped to include them. It wasn't to be as Fox were prepping their own movie (X-Men: First Class) and weren't interested in negotiating. 7. 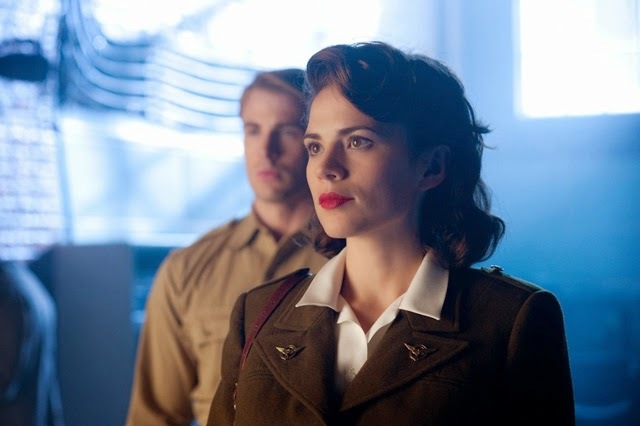 After having to withdraw from the part of Black Widow in Iron Man II due to scheduling conflicts, Marvel returned to Emily Blunt and offered her the role of Peggy Carter. This time she declined the role, feeling it wasn't right for her. Before Hayley Atwell signed on to play the character both Keira Knightly and Alice Eve were considered for the part. 8. The Captain America comic book that is shown in the movie bears the cover of the actual Captain America #1, released back in 1941. 9. At the exhibition, you can see a mannequin dressed in a red jumpsuit under a glass dome. This is a reference to the original Human Torch, the first superhero created by Timely Comics (later Marvel Comics) in 1939. Marvel recycled his abilities and name to use in Fantastic Four for Johnny Storm in 1961. And as you likely remember, Chris Evans portrayed him in the films. 10. One of the most impressive achievements of Captain America: The First Avenger was the depiction of 'Skinny Steve'. This was created in a number of ways. 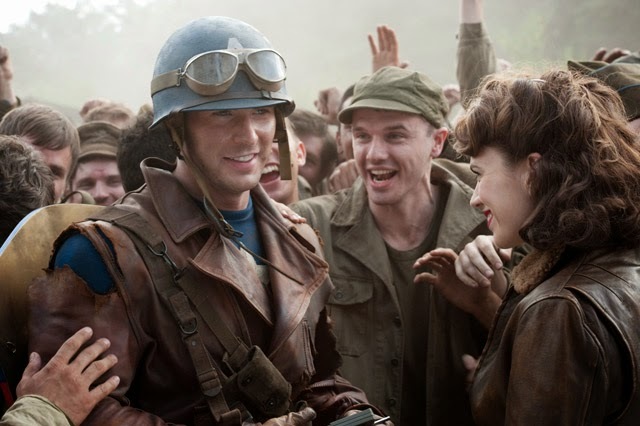 The filmmakers had originally planned to just use a body double and superimpose Chris Evans' face onto the double's body, but director Joe Johnston felt that Evans moved in such a unique way that no one else could perfectly replicate it. So the only time a double was used for 'Skinny Steve' was when Evans was sitting or lying down, or when a minimum of physical movement was required. The rest of the time the filmmakers utilised digital technology to "shrink" Evans down, essentially erasing portions of his physique, until they came up with the perfect "Skinny Steve". Over 250 shots were filmed like this, and because the shrinking process left empty space in the background, many of the scenes had to filmed in front of a green screen so that they could superimpose the backgrounds back in.